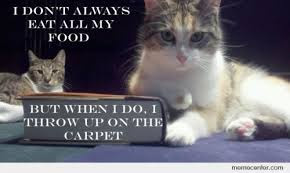 What's cleaning today at Able Carpet Care: My Pets both Dog and Cat vomiting on carpet rug curtain and chair. What do I do? 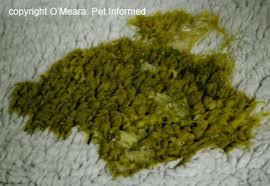 My Pets both Dog and Cat vomiting on carpet rug curtain and chair. What do I do? My Pets are vomiting on my precious fibres WHY? It’s an oldie but a goodie. I don’t know the original source of this but it’s pretty well known to dog lovers. Dog runs around the house and hides under furniture while making a prolonged ‘uuuuurka-guuuuurka, uuurka-guurka’ noise. (This noise is the only thing guaranteed to wake up a true dog lover who is hung over from a post dog-show celebration at 3:30 a.m.) After mad scrambling to capture the dog and drag him outside, the episode ends with an inaudible ten yard slimy yellow froth from the living room rug to the back door. Dog exercises hard and (a) eats large mouthfuls of snow (winter Blap Disease) or (b) drinks a bucket of water (Summer Blap Disease). 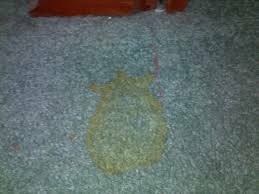 Within two minutes of returning inside, the dog spews out large amounts of clear slimy liquid while making a distinctive ‘blap’ sound and a sharp percussive noise as it hits the linoleum. Dog suddenly clears his throat with loud and dramatic ‘gggaark, gggark’ noises generally followed by prolonged ‘iiiksss’ and then loud satisfied smacking noises. 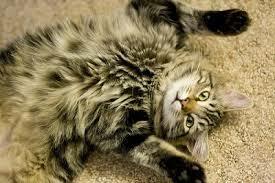 There is nothing on the rug. Don’t investigate, you don’t want to know. Apropos of nothing, the dog strolls into the dining room and waits till the innocent dinner guests are all watching him. Then, with a single deep gut wrenching ‘raaaalff’ dislodges the entire weeks’ contents of his stomach on the dining room rug. Marley, a Springer Spaniel, was always licking and chewing at her feet. Her owner, Lin, didn't know what to do about it, but she knew it was driving her 3-year-old dog crazy (not to mention turning Marley's snow-white feet dark burgundy). Lin decided to take her suffering spaniel to her veterinarian for some answers. Lin had guessed Marley chewed at her feet because they itched so much. Was Marley having a reaction to something she stepped in? Did she have bug bites? What Lin didn't know until she saw her veterinarian was that itchy feet is actually a classic symptom her pet is suffering from an allergy to pollen. Like Lin, many animal lovers don't know the signs of pet allergies because dogs and cats show different reactions to some of the same things we're allergic to. Grass pollen, for example, made Lin sneeze and her eyes water. That same pollen, it turns out, made her spaniel's feet itch. Depending on the type of allergy, your pet may exhibit different symptoms. Although pets occasionally exhibit watery eyes and some sneezing, the most common reaction is scratching. Constant scratching may lead to raised infected welts, open sores, and loss of hair. Ear infections are also common in dogs with allergies. Pets who are affected by allergies may suffer their entire lives; typically symptoms worsen as they get older. We can help alleviate some of that suffering by knowing the signs of allergies and finding the right type of product relief for the symptoms. There are many types of allergies that can affect your pet. Allergens that are inhaled or come into contact with the skin can cause allergies known as atopy. Common sources are pollens, molds, and dust mites. Allergies that result from flea-bites are referred to as flea allergy dermatitis. Certain allergies occur from items your pet ingests, and are typically called food allergies. Contact allergies are caused by something your pet comes in direct contact with, such as carpet fibers, plastics, and other things. Contact allergies are far less common than atopy and flea allergy dermatitis in pets.